State Route 91 (SR-91) is a transportation corridor with strategic value and local, regional and national significance. Every day, the SR-91 connects hundreds of thousands of commuters living in Riverside County with employment centers in Orange County, and vice-versa. The SR-91 is also the corridor of choice for commercial truckers transporting goods from the Ports of Los Angeles and Long Beach to store shelves in Orange County, Riverside County and the rest of the nation. On the weekends, locals use the SR-91 to reach essential shopping and recreational destinations, while visitors use it to visit entertainment and tourist attractions, from Disneyland, to the ballpark, to the beach. In short, commuters drive the SR-91 and the SR-91 helps drive our economy and our quality of life.And things aren’t likely to change. Projected travel demand requires that transportation capacity on the SR-91 and other viable options be studied and developed. As a result, the Riverside County Transportation Commission (RCTC), in cooperation with OCTA and the Foothill-Eastern Transportation Corridor Agency (FE/TCA), commissioned a feasibility evaluation of the Irvine-Corona Expressway (ICE) tunnels.The purpose of the study was to further define and evaluate site conditions that affect the feasibility of constructing transportation tunnels beneath the Cleveland National Forest and connect Orange and Riverside Counties. The feasibility study focused on a phased construction approach. Constructing one large reversible vehicular tunnel and a smaller rail tunnel as part of a first phase would potentially allow generation of toll revenues to support construction of a second large vehicular tunnel in a later phase. The design assumes current California Department of Transportation Standards. The project approval and environmental document (PA/ED) and the final design phases are estimated to take 7 to 11 years. Once the project is approved and permitted, construction of the initial phase of the project (single bore plus rail tunnel) is estimated to take up to 10.5 years, but construction could be expedited by strategically and effectively overlapping of activities. The second phase of construction timing (third bore) was not evaluated as part of this study. Financial Analysis – What would it cost to build ICE? The financial analysis results in a need for $28.3 billion in bond proceeds. Estimated tolls are not sufficient to cover debt service and operating costs. The high financing costs are attributed to the long construction schedule, capitalized interest, and inflation. Additional study of the Irvine Corona Expressway tunnel project has been deferred until such time as financial considerations improve and/or technological advancements warrant reexamination. Future tunnel discussions will be evaluated annually by the State Route 91 Advisory Committee as part of its State Route 91 Implementation Plan update. The annual review will determine if any of the major assumptions with regard to financial considerations, private sector interest, or technological advancements have changed to make the tunnel financially viable. SR-91 is the only direct commuter facility connecting Riverside County to Orange County. The existing ADT at the county line is 280,000 vehicles and is expected to grow to roughly 450,000 ADT by 2030. Existing SR-91 accommodates 12-14 traffic lanes. By 2030, the number of lanes will need to be increased to 22 lanes to accommodate the anticipated growth. Various constraints preclude accommodating the 22 lanes needed along SR-91. Commuter rail services within the SR-91 corridor are constrained with little room for growth. 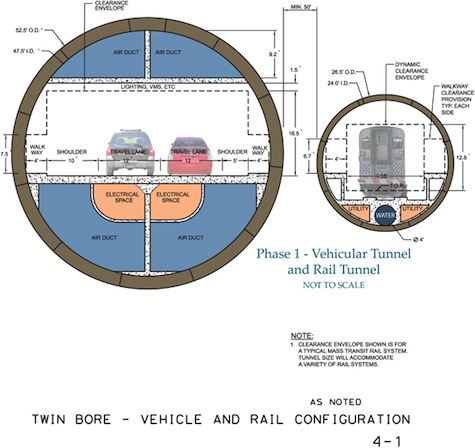 A two-lane reversible tunnel would accommodate a maximum capacity of 72,000 average daily traffic, with a daily average forecast from 55,000 to 65,000 vehicles per day (vpd).